green in the wild state, although captive birds are bred in a variety of colours. Noun. Colloquial. Early 20th century. Well flip me over and tickle me backwards - budgerigar, the most unimaginative and unexotic of pets, is actually Australian, and derives its name from the Aboriginal word bujari. 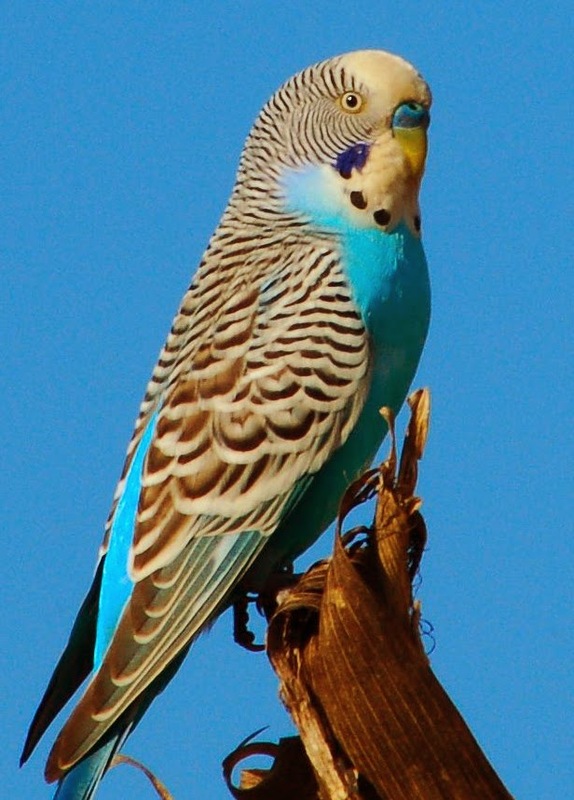 That is a surprise, for me anyway, but my only experience of budgies was my grandparents' budgie Joey. Every two weeks, my Dad and I would take the two-hour drive from Oxford to London to visit his elderly Mum and Dad, and highlights of said trip included playing with Grandad's compass, exploring their WWII bomb-shelter, and looking at Joey, a simple but friendly budgie who nibbled on his cuttlefish, pecked a mirror and occasionally said "Who's a pretty boy, then?" Being children of the Victorian era, my grandparents were never the most adventurous types, and I would love to know if they knew of Joey's truly transcontinental ancestry. Regardless of my associations, however, budgerigars are actually rather interesting. Bred since the 1850s, they're exceptionally social birds and can be taught (like Joey) words and simple sentences. In fact, some budgies have become internet sensations, and a few even managed to become famous before the advent of YouTube. For example, Sparkie (1954-1962) was a talking budgie from England with a repertoire of over 500 words and 8 nursery rhymes. Not only did he have an opera written about him (no Cats! jokes, please), but he released a record that, in those simpler times, sold 20,000 copies. On his death, the country mourned his passing in the only way it knew how - he was stuffed by a taxidermist, mounted, and put on permanent display by the Natural History Society of Northumbria, rightly ensuring that Sparkie will stay a pretty boy for many generations to come. Do you or have you ever owned a budgie? If not, do you (like me) know people with smaller vocabularies than your average budgie? Have you ever smuggled a budgie? Please budgeree your gar in the comment box below. This might sound a bit naive, but I can't see how someone dressed like that could smuggle more than five budgies on a long-distance flight from Australia. One in each Wellington boot, one in each fur-coat pocket and one in the mouth. But that's uncomfortable to say the least, and how is he supposed to ask for in-flight peanuts, or a hot face-towel or, well, anything? You'd need to get a return of about $500 per budgie to make the whole thing viable in the first place. Shouldn't he switch to heroin, or NSA secrets or something? If it was me, and I sort of wish it was, I'd just try to bond with the budgies myself. I'd sell the boots and the coat to fund building a little bespoke aviary for them, and then I'd sit alone in my underwear in the evenings, have a chinwag with the birds about Polly or crackers, and then wonder to myself where it all went wrong. His pose tells me that there's at least two more budgies smuggled about (or within) his person. That's seven, so perhaps we're drifting into the realms of commercial viability.